Osaka is one of Japan’s busiest hubs after Tokyo. The city, best known for the towering Osaka Castle and teeming street food thoroughfares is the economic powerhouse of the Kansai region. And that can be attributed to its prime location, being at the crossroads of the nearby Kyoto, Nara, Kobe, and Himeji that are all just a quick trip away via the Shinkansen. But despite being so central for tourists and business travellers, it was not until 2010 did Starwood open their flagship property in the city after years of a palpable void within the luxury market. 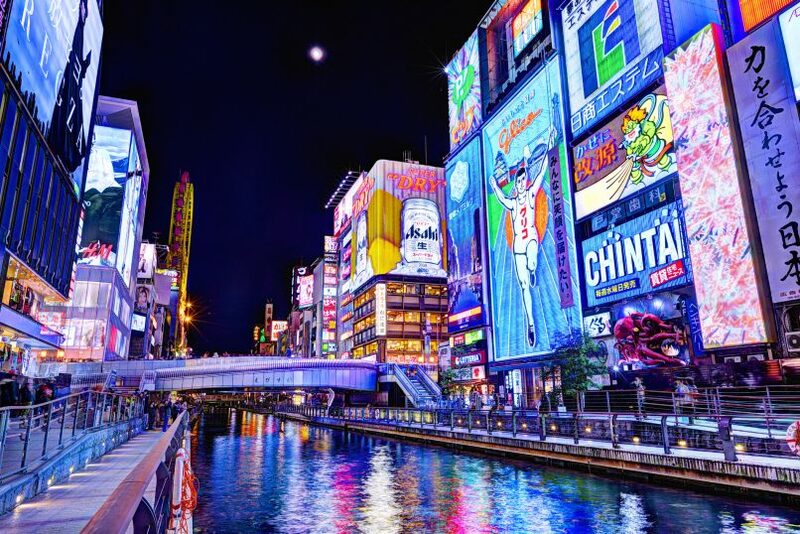 The advertisements along the Dotonbori River, particularly the Glico Man, are one of the most-photographed tourist attractions in Osaka. Enter the St. Regis Osaka. The brand itself is renowned for the ever-present yet always-discreet St. Regis Butlers, its carefully curated Family Traditions programmes unique to every all of its 61 sites, and a whole new level of luxury that can be seen as too ostentatious to some. But ostentatious it is not at the Osaka arm of the St. Regis, seeing as the Japanese are mostly prudent and understated, preferring quality materials and experiences over gaudy displays of wealth. Osaka’s answer to the Champs-Élysées in Paris is Midosuji Avenue, which the St. Regis Osaka proudly sits on. The 50-minute drive from Kansai International Airport will pass in a breeze, thanks to the picturesque scenery along the way. The garden terrace, located just beside the 12th floor lobby, sits right beside the tranquil Zen garden. Once you’ve settled down and checked in, a myriad of activities are right at your doorstep. The hotel is located at the northernmost end of the Shinsaibashi Shopping Arcade, an entire street of retail chains, hole-in-the-wall restaurants, department stores and luxury boutiques. And once you’ve reached the end of it, the street food mecca Dotonbori awaits across the river. Commuting via the subway is also a piece of cake, with the Hommachi Station that serves three lines of Osaka’s metro just across the street. And of course, the main attraction of the city, Osaka Castle, is just a quick 10-minute drive away. But make no mistake. Despite its proximity to Osaka’s best offerings, it is a quiet refuge from the hustle and bustle of the streets below. 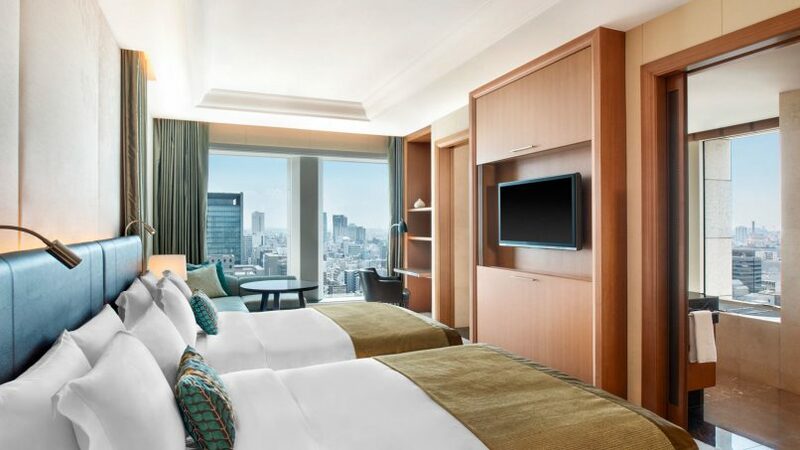 While most hotel rooms in Japan are infamously known for having only enough space for a child, the 160 rooms and suites at the St. Regis Osaka are spacious and beautifully designed to still feel cosy. Walk-in closets mean you won’t need to open your Rimowa suitcase on your bed just to unpack, and the floor-to-ceiling windows in every room let in a copious amount of natural light and offer an unparalleled view of Osaka city. 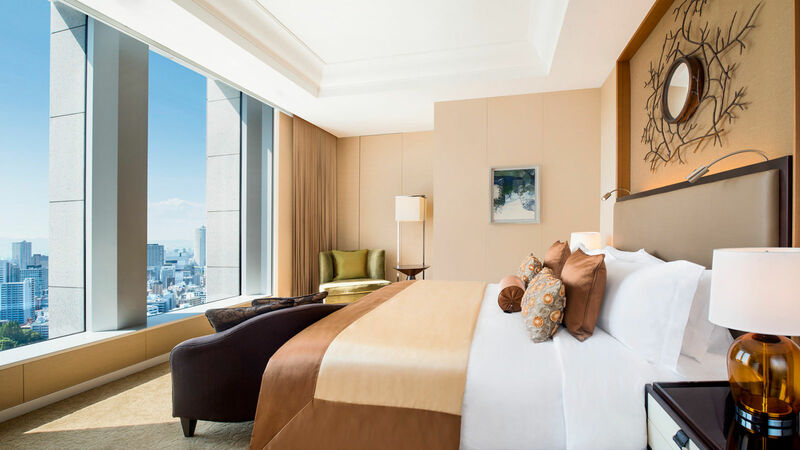 The rooms at the St. Regis Osaka are expansive yet cozy. Turn your attention to the bed which you’d be spending most of your time in, and you will find the softest 300-thread-count Egyptian cotton sheets that you’d want to sink into every night. If you happen to be staying in one of the Grand Deluxe Rooms, you’ll get a front row seat to the glorious city view from your bed without having to turn your head. Controlling the room’s ambience also doesn’t require you to get up from the bed, with the buttons for mood lighting conveniently placed at the bedside counters so you won’t be fumbling in the dark. Despite it’s contemporary design, every room still has an ever-present Japanese aesthetic, with gingko and cherry blossom motifs subtly lining your headboard. The soaking bathtub with a built-in TV is one of the many St. Regis specialties, and you’ll be provided with enough Remède bath amenities to last you an entire stay and more. The rooms are traveller-friendly, with power adapters at the ready so you don’t even need to ask your butler for one. And when turndown service happens at night, you’re given a kimono to lounge in at the end of the day in true Japanese style. There is no shortage of dining options when you’re a stone’s throw away from the Shinsaibashi and Dotonbori locales (as we mentioned above). 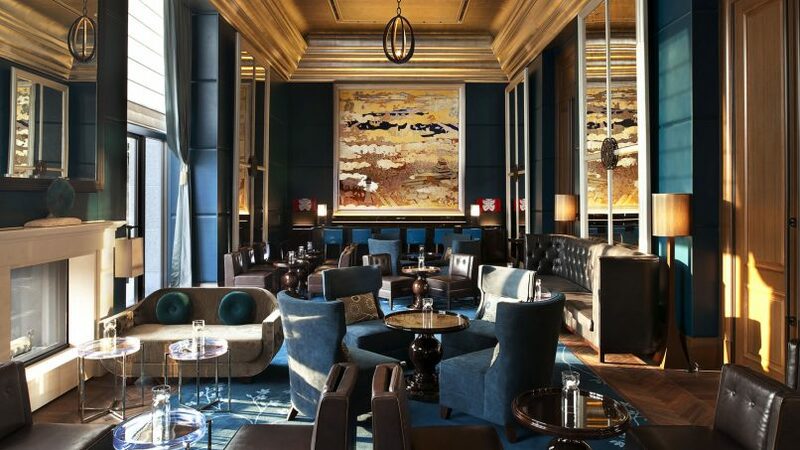 But should you choose to dine in-house, the St. Regis Osaka has two restaurants serving European cuisines: La Veduta (Italian) and Rue D’Or (French), the former of which is also where you’ll have your breakfast every morning. It’s a whole new world in the lush confines of the St. Regis Bar, designed to reflect the Momoyama era of Japan. If you want to adjourn to a more private setting after dinner, the sophisticated St. Regis Bar is located on the hotel’s 12th floor lobby. Think plush velvet chairs, deep turquoise carpets, tall mirrors, and a grand piano to tie the luxe package together. It is also where the St. Regis afternoon tea is located, where you’ll be treated to a sweeping view of the Zen garden terrace right outside. This might be where the St. Regis falls short as a luxury hotel. There is no swimming pool which other 5-star hotels in the city offer. The Iridium Spa that is exclusive to the St. Regis brand does not have a sauna or steam room, and for the price of the treatments there, you would think that they have more to offer. 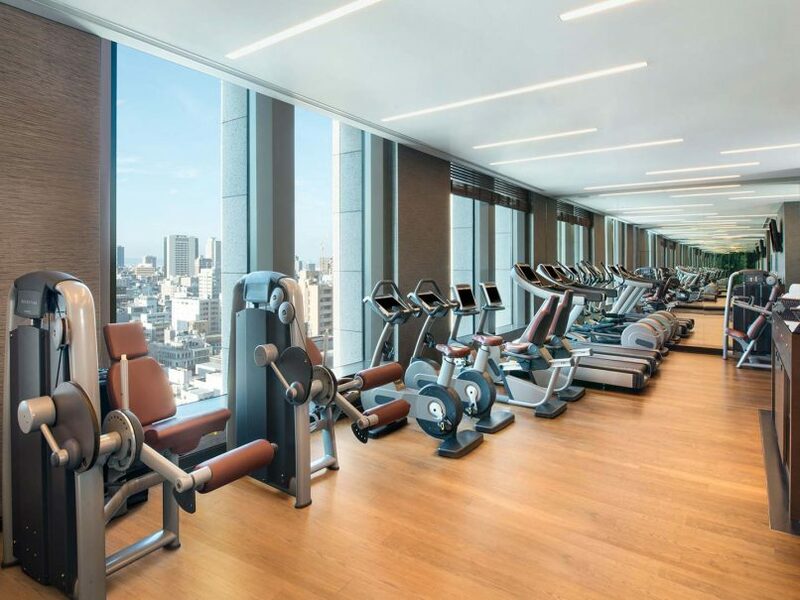 While the gym might be small, you won’t feel claustrophobic at all when you’re sweating it out with a view to die for on the 14th floor of the St. Regis Osaka. The fitness room, however, is kitted out with state-of-the-art TechnoGym equipment and has sportswear available for rental, just in case you forgot to pack your running shorts. It’s a thoughtful service also seen in other Starwood properties like the Westin. 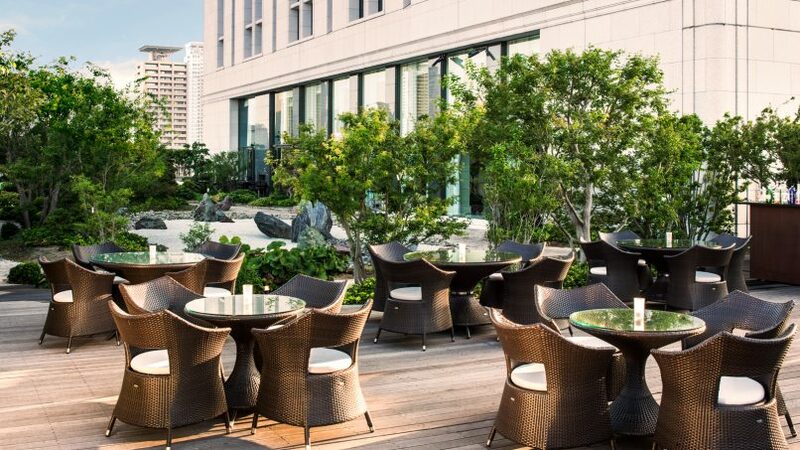 While there were some slight hiccups, there were many more hits than misses at the St. Regis Osaka. With its prime location, outstanding service, and the unforgettable view from the rooms, you’d be dreading the moment the alarm rings on the day of your check-out.